5 Bedroom Detached House For Sale in Nottingham for Asking Price £595,000. An extended five bedroom detached house in a cul de sac location near the canal tow path. 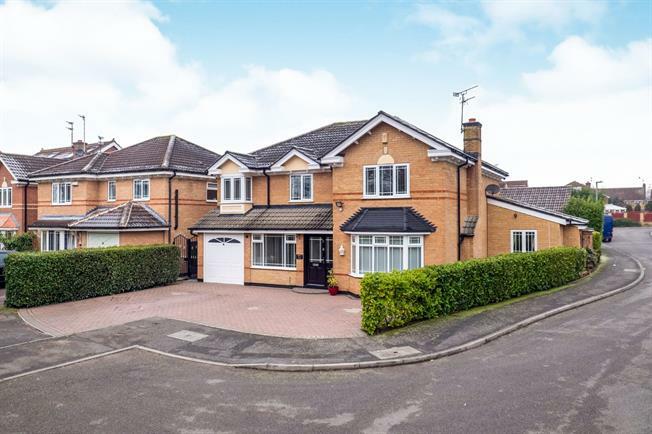 In brief the accommodation comprises entrance hall, lounge, dining room, family room, study, ground floor shower room, superb dining kitchen with folding doors to the garden, utility with additional gas hob. To the first floor there is a master bedroom with en suite, four further bedrooms all with wardrobes, shower room. Off road parking. Garage. Rear garden. Gas heating. Double glazed. Underfloor heating, tiled flooring, stairway to the first floor. Window to the front elevation, underfloor heating. Underfloor heating and heated towel rail. Low level WC, walk-in shower, vanity unit and wash hand basin. Window to the front elevation, radiator and electric fire, laminate flooring. Window to the rear elevation, French doors opening onto the patio, two radiators, laminate flooring. Double doors opening onto the patio, two radiators, laminate flooring. Window to the rear elevation, three skylights, folding doors to the garden, underfloor heating. Quartz work surface with built in table top, wall and base level units, inset sink, electric oven, microwave oven, warming drawer, five burner gas hob, overhead extractor, integrated dishwasher, wine cooler, space for an American style fridge freezer. Window to the side elevation, underfloor heating. Roll edge work surface, wall and base units, inset sink, five burner gas hob, plumbing for washing machine. Loft access, airing cupboard, storage cupboard. Window to the side elevation, heated towel rail, tiled flooring, tiled walls. Low level WC, single enclosure shower, wash hand basin. Window to the rear elevation, radiator, fitted wardrobes. Window to the rear elevation, heated towel rail. Low level WC, single enclosure shower, vanity unit and wash hand basin. To the front there is a block paved driveway providing off road parking and a garage which has an electric car charging point. The rear garden is mainly laid to lawn with a patio area, tap, power point and a shed.